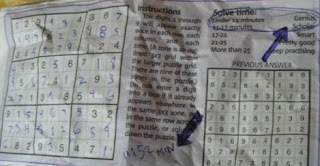 Do Friday' sudoku in 24 Hours. Monday is easiest. Friday is hardest. I got hardest! In less than hour! But I thought I mistake in center square near end. I frustrate. 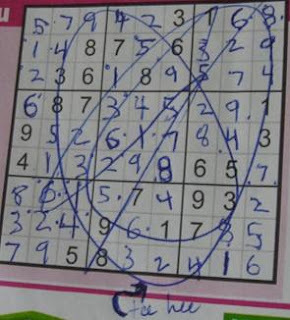 I scribble on sudoku. One minute later, I realize. I finish it properly. Satisfying. Do sudoku in Metro's daily. Many many many times. Many many times I do under 13 minutes. 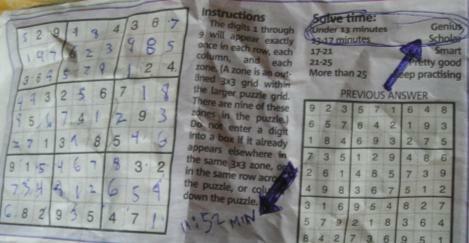 Many many many times Metros says I am "Genius." What does "Genius" mean, hmm Metro?! They will hear from me. Probably later. After I procrastinate. Signed up for World Jump Day. World Jump Day was July 20, 2006, 11:39 GMT. Or four AM pacific. I slept. It was not worth it. But I jumped yesterday. Weather, hot. Fourteen day trend of Vancouver (taken from Network du Weather site). Yellow means now, white means average. Caramba. Middle East still bombings. People take sides. People condemn. People die. People run. People pray.